Anyone who has been with us so far on this Hoth Topics journey knows that I am no stranger to strong opinions when it comes to Star Wars. It’s one of the running jokes we have. Believe it or not, I’ve softened the way I look at certain subjects in the past few years and yet I’m still the yelling guy with a lot to say and with the volume to say it. Realizing this about myself, I do play it up a bit for the sake of entertainment, and it’s usually taken in good stride by everyone around me. But recently, the Star Wars fandom has been going through some turbulent stuff. I’ve wanted to throw my serious two-cents in about the toxicity in the fan base, where it comes from, and how we respond to it. The title of these articles really says it all, this is my personal opinion, nothing more, nothing less. Let’s get one thing straight. Overall, I LOVE the Star Wars fandom. We all collectively get together to talk about this rich tapestry of content. For the most part, interactions I’ve had with people on a personal basis are fun, civil, and enlightening. However, there is a large segment of people out there who believe that Star Wars is not something to be shared, but something to be hoarded, divided, and fought over. Individuals that have this belief have been using social media platforms to spread messages of hate to Star Wars creatives, actors, and fellow fans. It has gotten to the point where people have had to leave those environments in order to improve their lives. It has been suggested to me that people should just ignore such internet comments, but I have witnessed firsthand this negativity spreading out from the web and into our day to day. 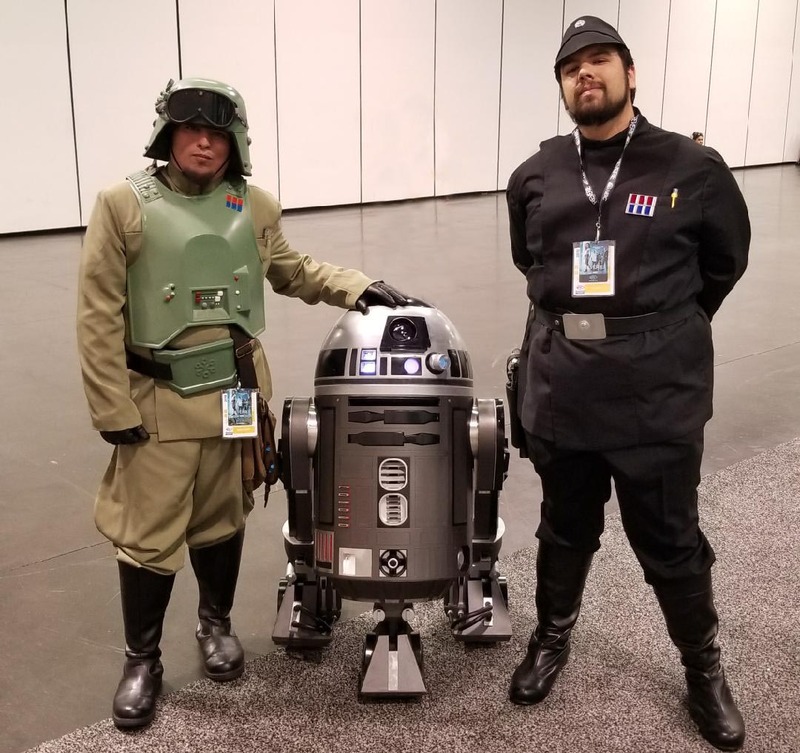 Both Jon and my girlfriend Katie had reservations about Katie’s Rose Tico cosplay because they feared a negative reaction due to the character’s divisive status. Jon was told by a person that they “F*ing hate the Star Wars fandom”, to his face while in costume at Wondercon. On a larger scale, anyone who had any affiliation to recent Star Wars projects has been repeatedly harassed and their entire bodies of work judged negatively, merely because they were a part of the newest Star Wars projects. Kelly Marie Tran, Daisy Ridley, Kathleen Kennedy, and Rian Johnson all have had ridiculous, vile things said to them or about them, and that’s just the tip of the iceberg. This kind of behavior, this toxicity, goes well beyond arguments of critiquing, reviewing, or sharing opinions. It is openly hostile, with extreme examples including threats of physical harm or death. So let’s take a second and look at WHY this is happening. You know that old saying, that goes something like “love and hate are two sides of the same coin”? Well, I think that’s basically what we’re dealing with here. We have individuals who have immersed their identity so completely into Star Wars, that when anything threatens that established self-image, they immediately feel threatened and lash out. The issue there is that they are lashing out at people who are, in reality, very close in nature to them. I LOVE Star Wars, and we put a lot of ourselves into this Hoth Topics project. I wouldn’t do that if Star Wars wasn’t a factor in my identity. That’s where the fights starts. Two stubborn forces whose only difference is their tolerance levels for new Star Wars things. The people who are loudest are the ones whose views aren’t typically listened to by the core fan base. When they feel like their opinions aren’t being taken seriously, they get more and more hostile. So let’s examine that. WHY are people reacting this way? The Last Jedi is not the first instance of this, but I think it’s the biggest, so I’ll be using it as an example. There are people out there who did not like what we got out of Luke Skywalker. And when you think about it, that’s a really fair point. He wasn’t what many had envisioned he would be. After years of investing into the character in the expanded universe, suddenly this hero, this paragon of modern day myth, acted and behaved completely different from what they came to expect. And when you are someone who ties themselves to these stories; that can genuinely hurt. With that in mind, there is a line that you do not cross between conversation and hostility, between debate and delusion. It is unfortunate that so many are unable to see this line and have chosen to assault any who do not share their beliefs. Everyone has a right to their opinion, even if you don’t agree with it. What they do NOT have a right to do is harass, threaten, or otherwise attack others who have differing opinions. Lucasfilm, Disney, cast members, crew members, writers, artists, or anyone who works on a Star Wars property are not trying to sabotage your childhood. They are all fans of the Galaxy we all love and anything they make is done to improve the franchise, even if it doesn’t meet any one person’s individual expectations. It takes hundreds, maybe even thousands of people to create a blockbuster film. The process is long, complicated, and a team effort. No one person is responsible for the end result. In addition, creators have a right to defend their work from people being toxic to them or their work, on social media or any other platform. They are people. Treat them like people. The right to say whatever you want does not protect you from the social response it may generate, be that positive or negative. Speculation is part of being a fan, but realize that things might not turn out the way you think they might, and be OK with that. That is really hard to do, trust me, I know. We don’t need to LIKE everything, but accept that what we get is what we get, and celebrate the parts we love, discuss civilly the parts we don’t. Open, civil discussion about our constructive criticisms will lead to Star Wars creatives taking the community seriously. Harassment and toxicity will lead to the death of Star Wars. Star Wars isn’t just “for” anyone. Star Wars is for EVERYONE. The entire reason I sat down and wrote this was that I have been inspired by the outpouring of individuals who have said enough is enough and have been speaking out against the toxicity in our fanbase on social media. It has long been a conversation I have had with friends, but it has reached a point where if we want our fanbase to become a welcoming place that will live into this next generation of Star Wars, we need to start speaking out on the same platforms where the hate is coming from. If you’ve made it this far, first off, thanks, I know this was a long read. Do me a favor, will you? Leave us a comment about your favorite positive fandom experience. It could be anything. Just let it out there. May the Force be with us all!